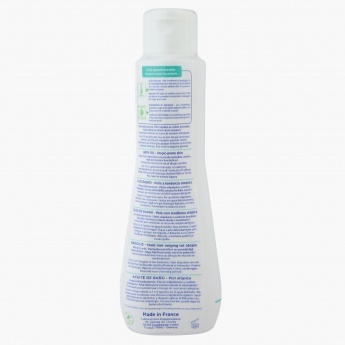 Mustela Bath Oil | White | Immediately replenishes the whole body, with long-lasting effect. Save AED 34 (40.48%) – Earn 5 Shukrans What is Shukran? Shukran is the Landmark Group’s award-winning loyalty programme in the Middle East, which allows you to earn Shukrans when you shop any of our brands. Massage your little one with this bath oil and improve the overall growth and development. Soft and gentle on the sensitive skin of your little one, this oil will enhance the skin tone and keeps it moisturised for a long time. Feature 1 : Immediately replenishes the whole body, with long-lasting effect. Feature 3 : Gently cleanses and leaves a protective film on babies and children' skin. Feature 2 : Instantly soothes sensations of irritation and tightness.